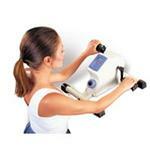 We proudly carry a variety of cardio exercise equipment, including state-of-the-art mini pedal exercisers. Our mini pedal exercisers are easy to use, but will still provide your patients with a solid workout. The Pedaler Exerciser, Pedlar Light Workout Exerciser, and Chattanooga Deluxe Resistive Pedal Exerciser are just a few of the exercisers found at ProMed Products Xpress.